Food Cravings are NOT your problem!!!! We’re often taught that food cravings are EVIL, and that we must AVOID the foods we crave at all costs. Stop letting your emotions and fear take control over your eating. Tag a friend in the comments below who needs to hear this message today! Being totally honest, I’ve been slacking when it comes to running lately. I’ve used the terrible Michigan winter and “hating the treadmill” as an excuse to NOT run. I went from running 100+ miles a month in November and December to 11 miles in January. YIKES. One of my goals for 2019 is to run another marathon and to break 4 hours (I finished my first in 4 hours and 11 minutes). I don’t care if you’re trying to lose weight, or run a marathon, or start dating, or make a career change... IF YOUR EXCUSES HOLD YOU BACK, YOU WILL NEVER REACH YOUR GOALS. ALL OF THESE ARE EXCUSES. Yes, there are times that we have VALID reasons for not taking action towards our goals. For example, if I am injured I WILL NOT RUN. Or, if you’re trying to lose weight but the ONLY option for lunch at an all-day work seminar is pizza, you NEED TO EAT THE PIZZA.. Chances are though, OUR EXCUSES are the biggest reasons that we aren’t achieving our goals. Can you think of any excuses that have been stopping YOU from achieving your goals?! Drop them in the comments below! I SHOULDN’T eat this pizza. I SHOULDN’T drink this glass of wine. Anytime you tell yourself you “should” or “shouldn’t” do something, you’re asking for a speeding ticket on the highway to the city of Guilt, located in the country of I’M NOT ENOUGH. Whatever action you “should” or “shouldn’t” be doing makes your current task or behavior seem WRONG… Which automatically leads to feelings of anger, resentment, failure, shame, lack of control, etc. What happens when we SHOULD on ourselves? We create a ton of pressure within ourselves to do or be something which we feel we’re supposed to do. Basically we are telling ourselves that we’re not good enough, we’re not healthy enough, we’re not smart enough, etc. If we don’t do what we “should” do, or if we do what we “shouldn’t” do, we feel wrong or guilty for our choices. SHOULD-ING strengthens our belief that we can’t trust ourselves, or that we don’t have enough willpower to reach our goals… Both of which are huge piles of POOP. Many of us use the words SHOULD and SHOULD’T so frequently that the words that follow these phrases (I should workout, I should eat healthy, I shouldn’t eat pizza, etc.) become MORE POWERFUL in our minds than our actual desires. In other words, our minds’ preconceived ideas about pizza, exercise, eating healthy and glasses of wine make the decisions FOR us, as opposed to what we really want. Feeling overwhelmed, guilty, anger, or resentful of the things you SHOULD do keeps you feeling stuck… The more you feel you SHOULD do something, the less likely you are to actually DO IT. SHOULD-ING is often tied into foods because we label foods as “good” or “bad” in our minds (which unconsciously leads to feelings of either happiness or anger/resentment). On a nutritious level, foods can’t be labelled as good or bad because foods don’t have power over their actions. Think about it: good humans are those who help others around them and are kind and loving. Bad humans murder, commit crimes, and take advantage of those around them. Foods can’t do EITHER of those things. Now I understand that you can have “bad” pizza at a restaurant, but that is because of how the restaurant prepared and made the pizza, not because of the pizza itself. All foods are simply more-nutritious or less nutritious for our bodies. At a biological level, our bodies CRAVE healthy foods because we need those nutrients to survive. A donut may have 500 calories but has little nutrients for it’s caloric count, compared to a chicken breast with veggies that has the same 500 calories but is loaded with nutrients. The calorie count is the exact same, so does it matter which one we eat? YES! Because the donut contains little nutrients, it won’t keep us feeling full and satisfied for very long. We will quickly feel hungry, and eat MORE foods than we don’t actually need. Because the chicken and veggies contain more nutrients, they will do a better job of keeping our bodies’ satisfied and feeling full for a longer time. Ultimately, when we associate foods as being “good” or “bad” instead of “nutritious” or “not-so-nutritious”, we feel we have messed up when we eat something “bad,” or we feel better about ourselves when we eat something “good.” In other words, research suggests that we feel BAD about ourselves when we eat “bad” foods, and we feel good about ourselves when we eat “good” foods. Remember that food is just food. It has no power over us UNLESS we give it power. So here is the golden question: How do we STOP should-ing on ourselves?! First, we become aware that it is happening. Start to notice your feelings and HOW you choose the foods you eat. Are you telling yourselves you “SHOULD” or “SHOULDN’T” eat certain foods, or are you taking control over food and consciously choosing to eat foods that you WANT to eat? In the moment, ask yourself some of these questions: Why should I choose this? Who says that I should choose this? Will this help me reach my goals? Does the BEST, HEALTHIEST version of me want to enjoy this? Lastly, start to replace the word SHOULD with I WILL… I CAN… I CHOOSE… I AM... I WANT. It’s a complete mindset shift that takes the pressure off of you. It takes the power away from the food and gives YOU the power to make the decision about what to eat without the emotional strings attached to it. Instead of telling yourself “I should eat more veggies,” try telling yourself “I will choose more veggies.” Or, instead of telling yourself “I want to be someone who exercises regularly,” try telling yourself “I am someone who exercises regularly. I promise that small mindset shift will help you think twice about your nutrition AND your exercise choices. By slowing shifting your mindset, you take back your power and you OWN your decisions. This doesn’t mean you never enjoy pizza, but it means that you can CHOOSE when you enjoy the pizza, which is extremely powerful. You also get to CHOOSE to eat more protein and veggies so that you lose weight and reach your goals. If you can stop SHOULD-ING on yourself, you can remove the stress and emotions associated with foods, and you can take back the power to choose what YOU want to eat. Does this post resonate with you? Do you struggle with SHOULD-ING on yourself, whether it comes in the form of eating healthy OR any other goal you’re trying to achieve? Drop a comment below! Ready to measure portions WITHOUT counting calories?! SO many women believe that in order to lose weight, they have to strictly count calories. In reality, calorie counting isn’t the best long-term strategy to leading a healthy life. What happens when you go over to a friend’s house for dinner and she doesn’t have the calorie count? Or, what happens when you go to a restaurant and there are no calorie counts on the menu? YOU DON’T NEED TO COUNT CALORIES IN ORDER TO LOSE WEIGHT! SERIOUSLY! My system of measuring portions helps my clients to lose weight without ever counting a single calories. And NO, my system doesn’t mean that you feel hungry all the time either! The only tool you need to correctly measure out portion sizes is your HAND! Your hand goes with you everywhere, so you’ll be able to keep your portions in-check while eating at your friends’ house AND while dining out at restaurants! HEALTHY FATS/CONDIMENTS: Each meal you eat should contain about 1 THUMB-SIZED serving of healthy fats (like nuts or avocado) and/or condiments. Especially if you’re trying to lose weight, be aware of your carb and fat portion sizes. If you need, cut back on those portion sizes and add 1-2 portions of veggies to your meals. I’d love for you to try out this system to help you portion your meals, and then comment below and share how it works for you! In October, I ran my first marathon (26.2 miles). While I EXPECTED the race to be a challenge, I expected to finish and feel amazing. What I DIDN’T expect was the reality of those last 6 miles. The first 20 miles I felt strong and quick. The last 6 were a completely different story. They were the HARDEST 6 miles I have ever run in my life. My legs were screaming at me in pain. I was physically and emotionally drained. I cried at Mile 22, where I called myself stupid and wanted to quit. Needless to say, my expectations of running a marathon and the reality of running a marathon were VERY DIFFERENT. Versus the reality of how I felt at Mile 25. In a similar way, almost every woman I work with must come to terms with the reality of weight loss, versus her own expectations. After helping hundreds of women lose weight throughout the course of my career, I’ve learned many things about the expectations of weight loss, versus what REALLY happens. Be sure to set yourself up for weight loss success by using these tips to help you become realistic about your goals. EXPECTATION #1: Losing weight will make you happier. REALITY: Current research suggests that while losing weight can lead to feelings of satisfaction and will make you temporarily happier, your overall happiness depends on MANY other factors in your life. As you lose weight and become healthier, focus on creating healthy work relationships, personal relationships, and hobbies too. EXPECTATION #2: The scale will immediately start to change the second you begin implementing new habits into your routine. REALITY: It probably comes as no surprise that changing your daily habits is one of the biggest determinants of long-term weight loss success. However, because habit change often starts off slowly, it takes TIME for results to happen. Expect that it might take weeks or months for the scale to change, and that’s NORMAL. Instead of focusing on instant results, focus on consistency and patience. EXPECTATION #3: Weight loss will be perfect & linear. Reality: Once you start seeing results, many of us expect the scale to change every single week. In reality, it’s NORMAL for results to vary! Some weeks, depending on the types of foods we eat, the last time we used the restroom, or even our hormones, the scale might go up before it drops more. Expect the scale to sometimes go up and other times go down... Daily fluctuations are healthy and normal. EXPECTATION #4: THE NUMBER ON THE SCALE IS THE ONLY WAY TO MEASURE PROGRESS. REALITY: There are literally hundreds of ways to measure progress as you begin to eat healthier and exercise. Are you more energized? How are you sleeping? How are your clothes fitting? How are your workouts feeling? Do you get tired and “crash” in the afternoon? How is your skin looking? There are just SOME of the questions you need to ask yourself as you strive to lose weight. Remember the scale is only ONE way to measure progress. These examples I give are only the tip of the iceberg. As you begin your journey to lose weight, give yourself some extra love when reality differs from your expectations. And whatever happens, DO NOT give up on yourself. Now that I know the reality of running a marathon, instead of giving up on running completely, I can better prepare myself for the next one! Share in the comments below… Have you ever experienced something where your expectations differ from reality? What was it, and how did you react? Often times, the women I work with struggle to make healthy breakfast choices that keep them feeling full and satisfied all morning long. Today's recipe is a fantastic option to meal prep for breakfast, lunch, OR dinner! Plus, it’s EASY! Seriously — it takes about 5-10 minutes of prep work, and once you put it in the oven, you’re free to do other things! Make this on a Sunday and have breakfast or lunches ready-to-go all week long! 1. Preheat the oven to 375 degrees. Grease a 9 x 9 baking dish with Coconut Oil as well as heat the 1 tablespoon in a medium sized skillet set to medium-high heat. Once the oil has melted add in the Ground Turkey and season with the Chili Powder, and Salt and Pepper. Continue to cook the meat until it begins to brown. 2. While the turkey is cooking peel and slice your Sweet Potato. Make sure your slices are fairly thin because if they’re too thick they won’t be as tender. Line the bottom of the greased baking dish with the sliced potatoes. In a medium bowl beat the Eggs with a whisk and season with salt and pepper. 3. Top the potatoes with the turkey and then pour the eggs on top. Layer the Spinach on top of the eggs as well as any additional toppings you’d like to add. 4. Place the dish in the oven and cook for 35 to 40 minutes or until the edges of the egg begin to brown and the casserole is firm throughout. Check the dish with about 5 minutes to go to see if you need to add any time. Note: If you want to make this as part of your meal prep (or the night before serving) and freeze it for later go ahead and fully prepare the dish then place in the freezer. To cook, let it defrost and then reheat at 275 to 300 degrees for about 15 to 20 minutes. 5 Easy Ways to Quit the Weekend BINGE! How many times have you worked SO hard during the week to eat healthy and exercise, only to blow it on the weekends? If you've fallen culprit to the weekend binge, don't worry, YOU'RE NOT ALONE! Heck, even sometimes I can have weekends that are the opposite of healthy! However, if you're trying to lose weight, keeping your weekends in-check is CRUCIAL to reaching your goals! Check out these tips to help you stay on track, even during the most fun weekend events! 1. Focus on being CONSISTENT instead of being PERFECT. Let's be real--the weekends are the time we should be ENJOYING our days without work! It is 100% possible to lose weight and still enjoy meals at restaurants, and even a special dessert or drink on the weekends. 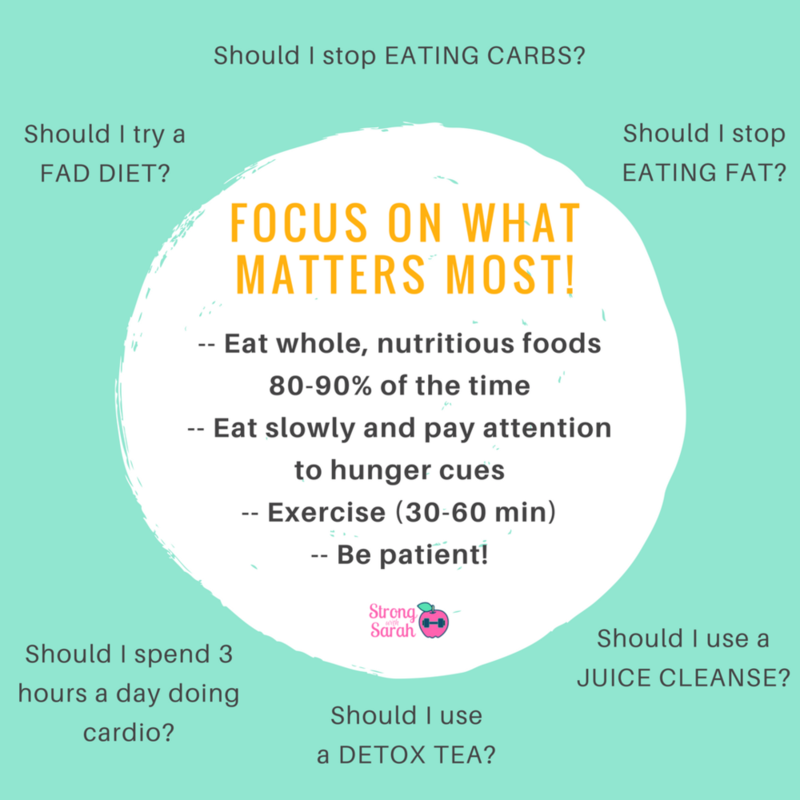 Instead of focusing on eating and exercising "perfectly," because that doesn't even exist, focus on making consistent, healthy choices when you CAN! Don't restrict yourself, but control how much unhealthy food you're eating. Eating a salad with veggies and chicken followed by ice cream cone won't cause you to gain weight, but eating pizza, burgers, fries, AND ice cream could cause you to gain weight. 2. Forget about "good" and "bad" food, and focus on portions. Here's the truth: Eating too much of the HEALTHIEST foods can cause you to gain weight. Instead of focusing on eating "good" or "bad" food, focus on the portions of ALL foods you eat on the weekends. It's definitely important that most of the foods you choose are nutritious, but use your hand to help you portion out each meal. For women looking to lose weight, include a palm size protein, fistful of vegetable, a small cupped hand of carbohydrates and a thumb size amount of fat in each meal, 3 or 4 times a day. 3. Plan ahead and be prepared! Often times, we know our weekend plans well ahead of the actual weekend. If you have an upcoming party or BBQ to attend, or if you know you plan on getting ice cream on a hot summer day, try to eat healthy, nutritious foods for MOST of the day leading up to your event. Then, when you arrive at the party or BBQ, you can enjoy some treats because you've stayed on track so far. On the flip, if you have brunch plans, enjoy your brunch and mimosas, but then get back on track immediately after brunch by having a healthy lunch or dinner planned. 4. Drink 1-2 glasses of water in between each alcoholic beverage! It's not uncommon for many women to enjoy a few cocktails on the weekends. Heck, that's one of MY favorite parts of the weekend! However, it's easy to over-do it with the booze, especially when you know you can sleep all day tomorrow! The first thing I want to stress is that there's no "BAD" or "GOOD" food choices. There are only more nutritious food choices, and less nutritious choices. Eating is a simple cause and effect situation. Everything we eat and drink takes us a little closer or a little further away from our health & fitness goals. Accepting the consequence is a great way to enjoy your food. Plus, accepting the consequences helps to to really hone in on exactly WHAT less nutritious food choices are worth eating and drinking. 3 Healthy Meal Choices for when you're feeling LAZY! Often times as women, we assume that cooking healthy meals means spending hours a day prepping and cooking in the kitchen. What happens when you want to cook healthy meals on a limited budget or with a limited amount of time? There's nothing worse than getting home from a long day at work, only to feel uninspired to cook ANYTHING. It's moments like this where a frozen pizza may sound appealing, but if you're trying to lose weight or eat healthy choices, what else is there to eat? Good news! There are PLENTY of healthy meal options that are delicious and can be made quickly. In fact, enjoying a laid-back, healthy meal is a great way to establish a healthier relationship with food and cooking. What do these quick meals have in common? First, they're nutritious and can help you to lose weight. Second, they help to keep you feeling full for a longer period of time. Lastly, when you fill up on the good stuff, there's less room in your stomach for the not-so-healthy stuff (like cookies, chips, and ice cream). Stir-fry can be made in a matter of minutes, it contains plenty of nutrients, and they are filling. Keep frozen veggies in your freezer and quinoa or brown rice on hand in your pantry. Chop up chicken breasts to mix with the veggies. Throw all ingredients into a sauté pan, add your favorite seasonings, and saute with a bit of oil, apple cider vinegar, lemon, low-sodium soy sauce, or your favorite chili sauce. Omelettes are one of my FAVORITE go-to meals for breakfast, lunch, or dinner. Grab plenty of your favorite veggies, scramble with eggs or egg whites, add a tiny bit cheese if you'd like, and cook in a frying pan. Omelettes are loaded with protein, healthy fats, veggies, AND they keep you feeling full for hours! When you're tempted to make a box of macaroni and cheese for dinner, take these few extra steps and I promise that you won't regret it! Cook a cup or two of whole wheat pasta. Drain a can of tuna fish and garbanzo beans (or any other beans of your choice). Toss the pasta, tuna, and beans in a dash of olive oil and fresh lemon juice, and top with a bit of parmesan cheese. If you're looking for extra flavor AND fiber, add a can of artichoke hearts! Cooking healthy meals at home doesn't always mean spending hours every day prepping healthy meals. Always remember that spending 5 minutes a day or spending 95 minutes a day doesn't change the QUALITY of meals that you cook. If you're looking for more easy, healthy meal options, be sure to join my free Facebook group for women here! Are *HEALTHIER* snacks really healthier for you? I'm not going to lie to you... Years ago, these nutrition facts surprised me when I compared the two! Back when I was trying to lose weight, I *THOUGHT* trail mix was a great snack choice! Often times, it's labeled as healthy, organic, or high-protein. YES, it may be organic, or contain a good amount of protein, or healthy to some, but it has almost the EXACT SAME nutrients as a Dairy Queen Blizzard. This is really important to note--I'm not trying to compare what's the "healthier" or "better" option between trail mix or a DQ blizzard. I'm simply showing that a food that MANY of us believe(d) to be *healthy" is loaded with just as many calories (and fat) as a Dairy Queen Blizzard. At the end of the day, the quantity of calories you eat, no matter where they come from, will dictate whether you gain weight, lose weight, or maintain the same weight. So how do you know you're choosing the healthiest snacks, especially if you're trying to lose weight? Should you count calories and check nutrition labels? NO and YES! If you've been following me for awhile, you know that I DO NOT BELIEVE IN COUNTING CALORIES! Seriously, it takes so much time and ISN'T necessary to lose weight! But should you be checking your nutrition labels? YES! I highly encourage you to check the ingredients of your snacks. Here's my general rule of advice for snacks: The fewer ingredients, the healthier it probably is. If you're looking for the healthiest snack choices, stick with the basics! Try to choose foods that come in their natural state. Whole pieces of fruit, vegetables, greek yogurt, or cottage cheese all make great snack choices! If you're looking for more healthy snack or meal choices, be sure to join my *FREE* Facebook group for Women here! What happens when you doubt your fitness and nutrition plan? When you begin to doubt your fitness and nutrition plan (because let's get real... it happens to all of us! Especially if we aren't seeing results as quickly as we would like,) focus on what matters most! Within a matter of seconds of googling "weight loss," you'll be bombarded with advertisements for fad diets, magic potions and pills, body wraps, juice cleanses, and detox teas. Here's the worst part. They all have raving testimonials. You'll see pictures and quotes from people who got "amazing" results with little to no effort. ... And you're going to start wondering if it really IS possible to lead a healthy life or lose weight while still enjoying chocolate and wine on special occasions. How are you supposed to choose the *BEST* product for your body and your goals with all of the options on the market? What often happens is you can't decide which is best... So you don't commit to ANYTHING and you end up staying stuck exactly where you're at today. There's always going to some fad diet or program that is the latest and greatest way to lose weight. Often times though, the programs promise weight loss but can be detrimental to your overall health. They eliminate important nutrients that your body needs to properly function. Or, they include too much of one macronutrient, placing additional stress on your bodies' organs. Plus, these "hot off the press" fad diets and programs don't really teach you anything. Once you finish the program, you usually end up gaining the weight back that you lost because you haven't learned how to sustain a healthy lifestyle. No matter what, your body needs to burn more calories than you consume to lose weight. This does NOT mean you need to count calories, but it DOES mean that you need to eat nutritious, real foods (such as lean protein, vegetables, fruits, and complex carbohydrates) MOST OF THE TIME. You'll want to include strength training into your exercise routine so that you can build muscle and rev your metabolism. Most importantly, you'll have to be PATIENT. Losing weight, creating healthy habits, and leading a healthy life long-term takes a LONG time. Don't let this discourage you, but let it EMPOWER you. Every decision you make on a daily basis affects your fitness and nutrition habits. Focus on what matters most, be patient, and ENJOY YOUR OWN JOURNEY. If you're looking for the knowledge, support, and guidance to start creating your own healthy journey today, I encourage you to book a free consultation call here. On the no-pressure call, we'll talk about your body, your goals, and how I help my clients to achieve the body and the life of their dreams. Check out this On-The-Go WORKOUT! This workout is PERFECT for you to complete at work or at home! It doesn't require any equipment. You can take 5 minutes or 60 minutes to complete this workout. Complete as many cards as you can in the time you have to exercise. Plus, if you travel often for work or for pleasure, it's super convenient to complete in your hotel room! 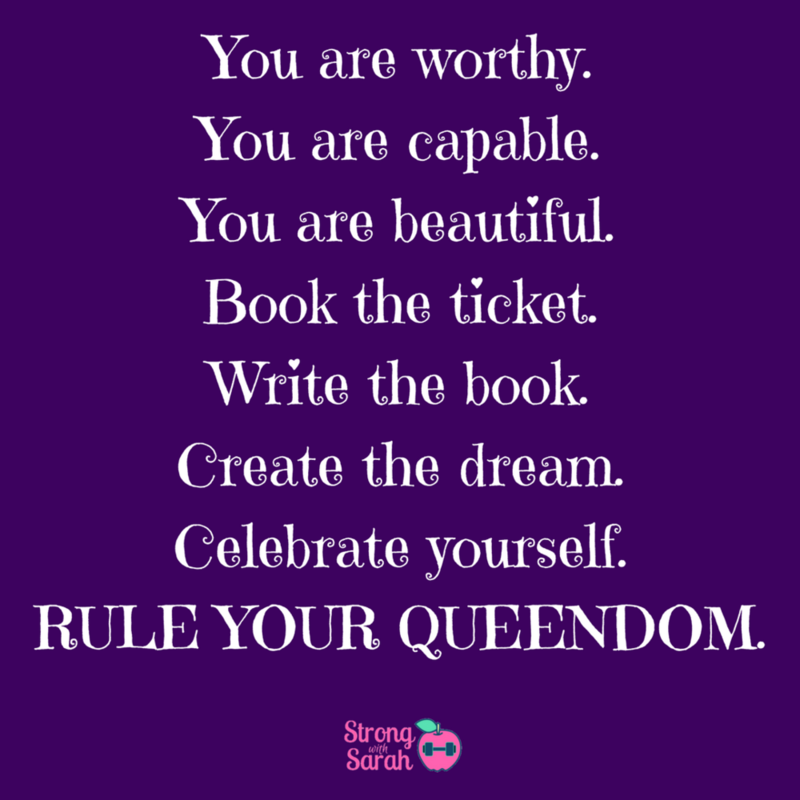 If you're looking for more free workouts, be sure to join my Facebook Group for Women here! What would happen if you only got ONE CAR in your life? Yes--I am a nutrition, fitness, and weight loss coach. You're probably wondering WHY I am writing about cars. I promise this blog post is extremely important, so please read the entire thing! I'm starting this with an analogy by Warren Buffet. Imagine that you turned 16 years old, and that you got to pick ANY brand new car that you wanted. It could be a BMW, a Lexus, a Mercedes... ANYTHING you want! Here's the catch though: You only get that ONE car to last your entire life. If something happens to that one car, you can't get another one. How would you treat your car on a daily basis? What would you do to take care of your car? I'm guessing that you would do ANYTHING and EVERYTHING in your power to take care of that car. Because you KNOW it's the only car you'll ever have, chances are you'll take AMAZING care of it. In reality, if something ever happens to your car, thankfully you are able to get a new one. Remember that we all have only ONE body and mind. And how you treat it on a daily basis matters. Treat your body and your mind like they are your most prized possessions--because they are. And just to be clear, I'm not talking about buying yourself luxury items... I'm talking about making your health a priority. Work on creating healthy nutrition habits. Find time throughout your day to exercise. The actions you take on a daily basis matter. Sure, enjoying one alcoholic drink a week probably won't negatively affect your health... But enjoying one or more alcoholic drinks a day probably will affect your health. Remember that treating your body well involves more than just watching the foods you eat. It also includes watching the foods you DON'T eat. For example, if you're following a strict diet and you never eat carbs, you're probably missing out on important nutrients that can help prevent against Type 2 diabetes and cardiovascular problems. If you're ready to take the next step in changing your life by learning how to take care of your "car," I encourage you to check out how I work with my clients. Every single day, YOU are the one who is in the driver's seat of your car. You have the power to decide how you want to live your life and how you want to treat your body. And how you treat your body on a daily basis matters. 4 Reasons You Should Start Exercising NOW! It's science. Today's research suggests that exercise releases feel – good endorphins into our bloodstream. In fact, a study at Penn State University suggests that people who exercise, regardless of the intensity, had more pleasant feelings than those who did not work out. This study also noted that participants were happier on days that included physical activity, as opposed to days they did not exercise. 2. Exercise can help you sleep better. If you're prone to tossing and turning at night, exercise actually helps to strengthen your body's circadian rhythms and can help you to fall (and stay) asleep! However, the results are not immediate. Research suggests that it can take up to four months for exercise to help study your circadian rhythm's, so start hitting the gym now to get a better quality sleep over the next few months. As I mentioned earlier, it comes as no surprise that we all lead busy, complicated lives. There are tons of ways to deal with stress, many of which can negatively impact your health and fitness goals. Eating a pint of Ben & Jerry's may seem like the best way to deal with a stressful situation, but I promise you that you'll end up feeling worse about yourself afterwards. You know that exercise can make you happier, but it can also help to reduce stress by stopping the release of stress hormones that flow throughout your body. Sure, it's great to see the physical results of exercise. I'm talking tone arms and abs, a tiny waist, and chiseled legs. For me, the mental results that my clients gain are much more important than the physical ones!! By slowly increasing how much weight you can lift or how far you can run, you'll gain confidence that will bleed into other parts of your life. It's simple--crushing your workouts and FEELING the gains helps you to feel good in all areas of your life! In addition, exercise improves your mental strength. Let me be real with you, there are definitely days when I wake up and do NOT want to work out. However, once I complete the work out, I feel energized and never regret putting in the work! Plus, I know that I can push myself into that zone that's a little bit uncomfortable. Sure, it can be scary to lift heavier weights than you're used to, or running a further distance than you ever have before, but that's where the real magic happens! A 30-minute workout is 2% of your day. That's all you need to gain the benefits listed above, and to start seeing great results. Instead of finding excuses and reasons that you can't exercise today, take action find a type of exercise you love. Get up and get moving! Make a commitment to your health today, and look and feel better tomorrow! 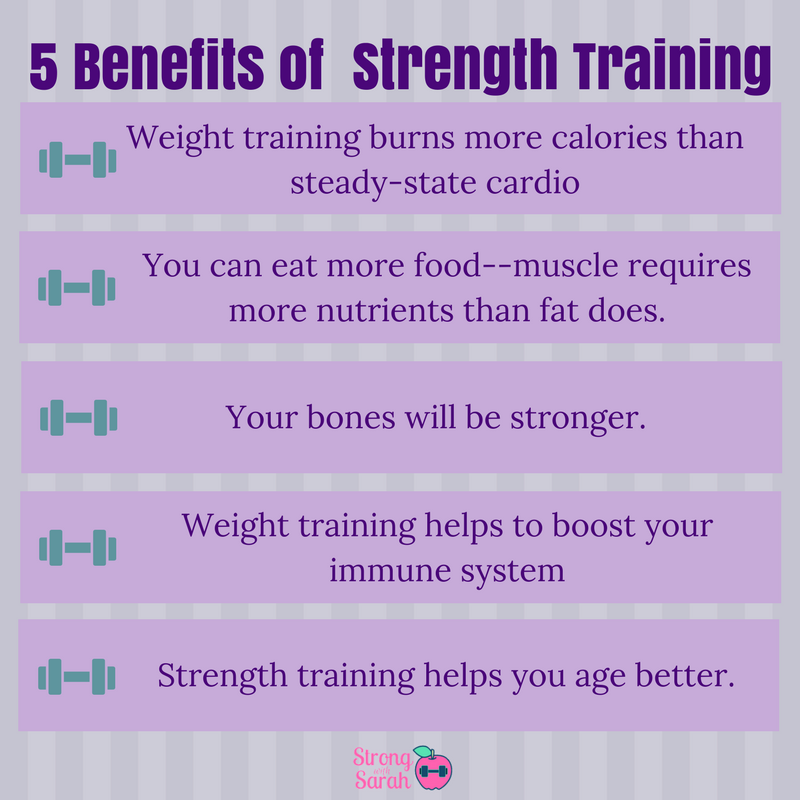 5 Amazing Benefits of Strength Training!!! It's no secret that I'm a HUGE believer in the idea that reaching one's health and fitness goals comes down to having healthy nutrition habits. However, this doesn't mean that you can just forget about exercise and sit on the couch all day...(don't we all wish?!). long with solid nutritional habits, exercise plays a critical role in losing weight, gaining lean muscle mass, and becoming stronger. Often times, the only experience with exercise that my clients have before working together is as a "cardio queen." I'm talking about women who spend hours and hours on the treadmill or the elliptical. Does it sound familiar? 1. Weight training burns more calories than cardio. Overall, weight training burns more calories than steady state cardio. While you're lifting weights, you'll burn fewer calories. However, after your weight session, your metabolic rate will be higher, and you'll be burning more calories for a longer period of time! 2. You can eat more food! It's simple; muscle requires more fuel to maintain than fat does. The more muscle you have on your body, the more calories you need to eat to keep your body properly functioning. Especially if you're hoping to gain lean muscle mass (hello six pack! ), you must add protein-packed foods to your diet! 3. Your bones will be stronger. Weight training add stress to your bones. As a result, your bones become stronger and more sturdy. This helps to prevent the loss of bone density, which can begin when women hit their mid-30s. Strengthening your bones can help protect you from fractures and breaks in the future. 4. Weight training boosts your immune system. Studies suggest that moderate weight lifting reduces stress levels. This allows for the production of more white blood cells within your body, which helps to fight off infection and disease. 5. Your body will age better. All of these benefits add up to a stronger and healthier life for you to live longer. Improved circulation from weight training helps to keep your hair, nails, and skin in great condition. Gaining lean muscle mass and burning more fat will enable you to wear the clothes you love. You will have better balance with a decreased chance of falling. If you do happen to fall, your chances of fracturing and breaking a bone are lowered. While cardio is important to add to your exercise routine, The benefits of weight training surpass those of cardio when it comes to gaining muscle and losing weight. If you're looking for a beginner strength workout, grab a set of weights and click here for a free leg workout!